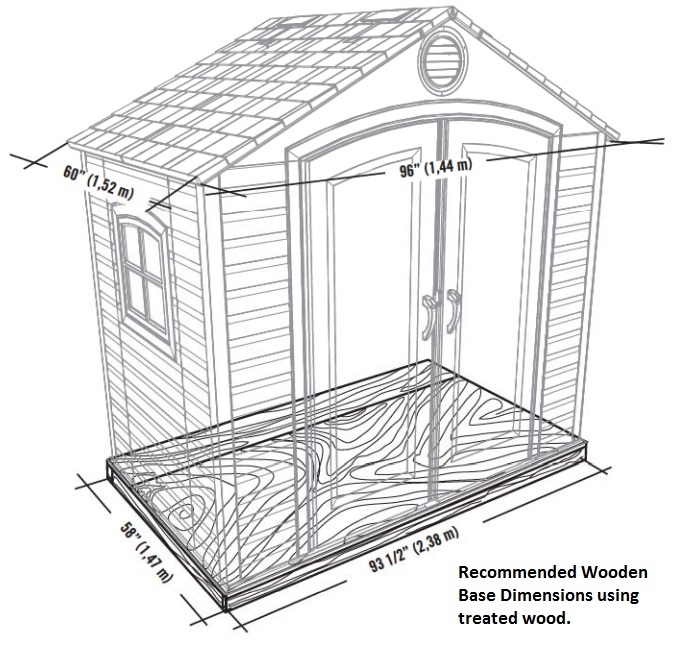 Lifetime sheds provide you an excellent yard storage solution that will last for years to come. This shed uses a paneling design to assemble the shed; adjacent panels interlock and fasten together. 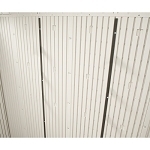 The shed is then reinforced on the inside of the shed with powder-coated steel. The shed doors have a built-in padlock (actual lock not included). These sheds come with a 10-year factory warranty from Lifetime Products. This lifetime outdoor storage shed is durable, sturdy and is designed to meet a broad range of storage needs. 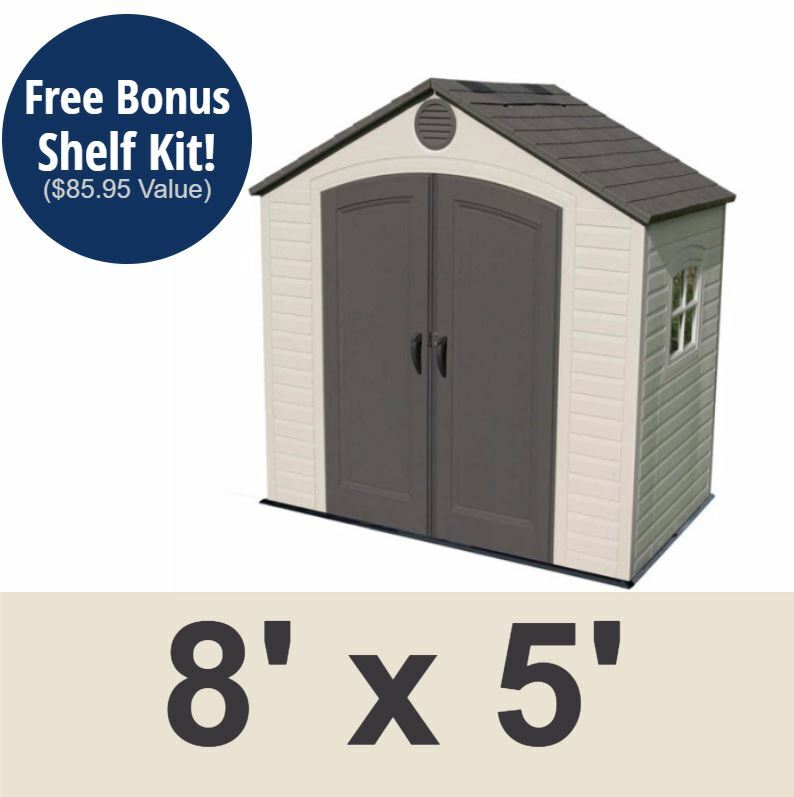 Great shed for Lawn and Garden Organization & Storage! The Garden Sheds are putty colored with darker brown trims. Lifetime sheds fill many different needs for outdoor storage needs. The 6406 is a smaller floor plan ideal for storing pushing/self-propelled lawn mowers, gardening supplies, and yard tools. * Lifetime Plastic Shed extensions sold separately. Nominal Dimensions - 8 x 5. Footprint - 94 inches w x 58 inches d.
Exterior Depth - 55.5 inches . Exterior Roof Depth - 60 inches. Interior Depth - 54 inches. Square Feet - 33.8 square feet. Cubic Feet - 232.7 cubic feet. Window - One (1) 17 inches w x 17 inches h Polycarbonate Window - Opens Half Way. 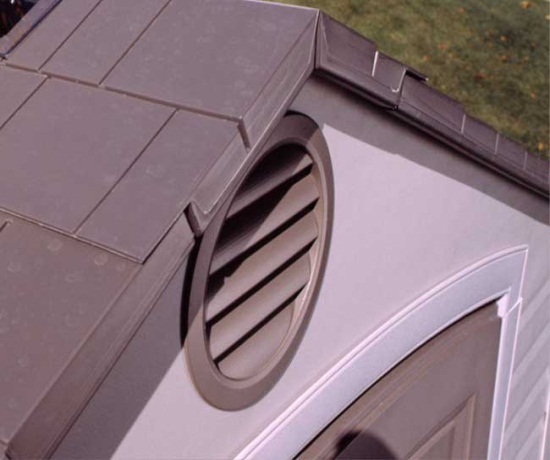 Included Skylights - Two (2) Polypropylene Skylights located along the ridge of the roof. Includes Shelves - Two (2) Front Corner Shelves - 9 inch radius, Three (3) Rear Shelves One (1) 90 inch W x 9 inch D, Two (2) 30 inch w x 10 inch d.
Great shed, easy to assemble. Great Merchandise - fast shipment. Thank you. Great quality shed. Fast delivery. Takes time to put it together though. Great product, good communication and shipping! Just what I ordered. Great seller. No Problems!!! Thanks. Q: If I wanted to paint it a different color, would paint adhere? A: Officially, you cannot paint a lifetime brand storage shed. The paints will eventually flake off since it is a polyethylene plastic. Polyethylene is a very very good plastic for outdoor storage sheds as it is soft and allows for expanding and contracting in the elements. Then expanding and contracting can be problematic if you paint this. Having said that sometimes customers do paint them in the use of paint they purchase from a local hardware store that is designed specifically for plastic. It is definitely not something we recommend. A: This item does not have free shipping at the moment of this post. Please add it to your cart, type in your zip code, and it will give you a quote. Feel free to contact us with any other questions. Q: Where can I see this shed in the Greenville SC area? My homeowners association is very picky. Color must match my siding as much as possible. You've used the terms "putty" & "desert tan" in your answers to questions about the color. That could be a very wide range of colors. A: Very true and very good point. We don't have any local stores-we are online only. Besides Utah we don't have any place where you can see when in person. However, if you see any lifetime shed-as long as it is a lifetime brand-they are all the same color. Q: Does this model, 6406, comes with the window on the right as you face the doors? 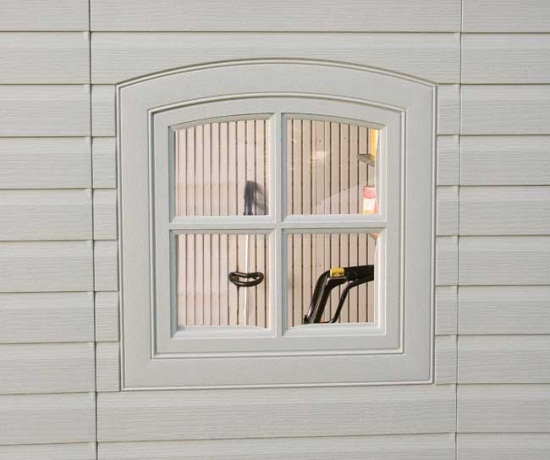 A: You can put the window on either side when it is assembled. Just exchange the wall panels. Q: I am resident in the Costa Blanca Spain. Do you deliver to Spain if so price of delivery to Spain? Q: Is this a brand new shed? A: Yes, brand new. Unopened. Q: What is the difference between Model 6406 and 6418 ? A: They are the same with the exception of the extra accessories. 6406 has window and shelving. 6418 has no windows and no shelving. Q: What color is the shed? Do you do home delivery? Is it hard to assemble. 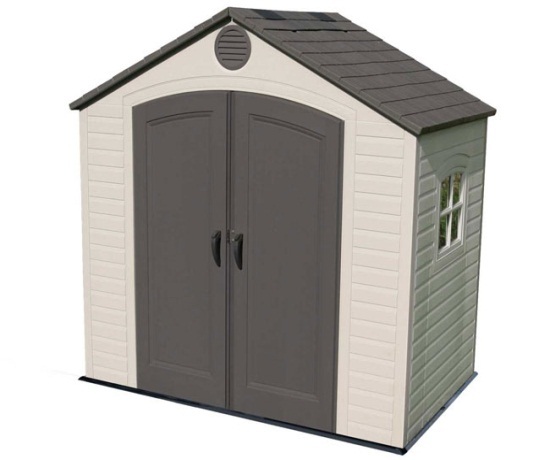 A: Garden Sheds are putty colored with darker brown trims. We do offer home delivery and there is a lot of assembly but many people assemble them just fine. Time to assemble depends on your experience and so forth. A: The shed walls are desert tan, the roof and doors are brown (but with a bit of gray). Delivery goes to your driveway/curbside. Assembly is simple, but can be time consuming (a few hours). Feel free to contact us with any other questions. Q: Shipping cost to middle GA? A: Please add this item to your cart and type in your ZIP Code to check the freight to your location. Q: What is the difference between this model and model 6418? A: Model 6406 has a lot of shelving and one window. Model 6418 has no shelving and no window. Businesses generally prefer model 6418 and residences generally prefer model 6406. Q: will this shed fit a 4x8 foundation? A: The foundation must be at least 5' x 8'. It could be larger, but not smaller. Q: Does this model comes in 10x8? Thanks. 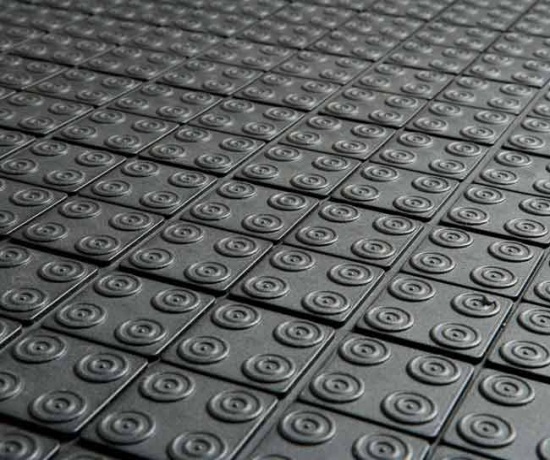 A: the closest model would be model 6405 which is 8 feet wide by 10 feet deep. If you're looking for something that is 10 feet wide and 8 feet deep then I would consider model 60005. Q: how Long does delivery take once you resume delivery on November 9th ? A: It depends on your location. They ship from Utah so the closer you are the more quickly you will receive it. We estimate about 5 to 10 days to receive once it ships out. 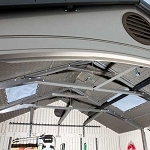 Q: What is the 6406 Lifetime storage shed typically used for? 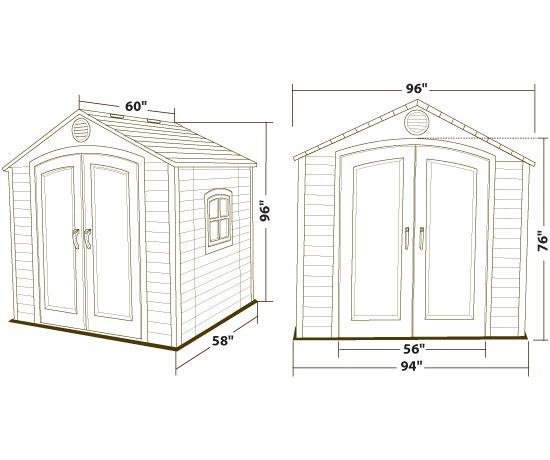 A: This shed is one of the more compact sizes from Lifetime. It does have enough depth in the floor plan to store most pushing lawnmowers or other similarly sized pieces of yard equipment. The included shelves provide space to store smaller yard products. A: Yes, we can ship this item to Canada. However, as our cost to do so is very high, Canadian customers are frequently able to get the product across the border cheaper than we can. If you have a United States address we can ship to, you will typically save money bringing it across the border, paying the required fees, then for us to ship directly to you. Shipping costs on the shed is noted in the "Check Ship Rates" link at the top of the listing. Please note that these videos are meant to provide general information for this product and have been created by individuals that have owned or used this shed. The details of the 6406 are listed on our website listing. Please do not use specific details from the video to know what comes with the 6406. Shipping: Orders for the Lifetime 6406 generally leave the warehouse within 2-4 business days. Delivery Details: This product ships directly from the warehouse in Clearfield, UT. This item generally ships via a curbside delivery through an LTL carrier (too big for UPS and FedEx). The customer must be present to sign for the order. The freight carrier is instructed to contact you prior to delivery to set up a delivery appointment. The customer can either contact the freight company themselves once they have the tracking number, or they can wait for the freight company to contact them to schedule the appointment. Ltl freight carriers will frequently have some flexibility with scheduling delivery once the product at the delivery terminal within 7 days (not business days) of the item arriving at the terminal. The terminal can hold on to the item longer than that as well, but they will begin charging storage fees to the customer after 7 days of the product sitting at the delivery terminal. Box 1 labeled 64060: 95 inches x 32.33 inches x 8 inches H; weighs about 213 lbs. Box 2 labeled 64061: 95 inches x 32.33 inches x 8 inches H; weighs about 163 lbs. Dimensions: 96" x 33" x 21"